Skywatchers by the millions looked up Sunday (May 20) when the moon hid most of the sun in a rare solar eclipse that created a dazzling "ring of fire" that was visible from Asia to the United States. An estimated 6.6 million Americans, alone, lived along the U.S. path of the solar eclipse, with millions more soaking in the sight from across southern China and Japan. While spectators along a narrow track saw the moon block out up to 94 percent of the sun, leaving a bright ring round the edges, many other viewers across a wider region reveled in partial solar eclipse views. "The eclipse was amazing!" photographer and skywatcher Jeff Berkes of Pennsylvania told SPACE.com in an email. "We got some amazing pictures today." Sunday's eclipse was what scientists call an annular solar eclipse, which occurs when the moon is in a point of its orbit that crosses the sun as viewed from Earth, but is just far enough away that it doesn't completely block the sun in a total eclipse. The last time an annular solar eclipse was so widely visible to U.S. skywatchers was in May 1994. The solar eclipse was even visible from space (by two satellites and astronauts on the International Space Station), according to NASA and the European Space Agency. From Asia to the U.S.
Sunday's solar eclipse began in southern China in the Gulf of Tongking, to the north-northwest of Hainan Island, where the local time was actually Monday, May 21. The eclipse's path then carried it eastward to Hong Kong, where clouds and foul weather spoiled views for observers at the Hong Kong Observatory and Hong Kong Space Museum, which hoped to broadcast the event, according to press reports. In Japan, electronics manufacturer Panasonic sent an expedition to the summit of the country's iconic volcano Mt. Fuji, in hopes of broadcasting the eclipse live as part of the Panasonic Eclipse Live from Fujiyama by Solar Power project. About 277,000 people tuned into the webcast, which included views from the summit and two satellite camps all run on solar power, but storm conditions blocked the view from atop Mt. Fuji. "We gave it our best shot," said Jeff Jensen, an MC with the Panasonic's Mt. Fuji summit team for the webcast. "We were hoping to get a glimpse, but we just couldn't see it. It was almost a whiteout. In Tokyo, amateur photographer Tom Bridges spotted the so-called "ring of fire," the precise moment when the moon's dark disc is in the center of the sun, from his apartment on the 25th floor of a high-rise building. The event, he told SPACE.com, was hindered only by a screen of broken clouds. Spectators in special solar eclipse glasses stare at the sun during the annular solar eclipse on May 20, 2012. 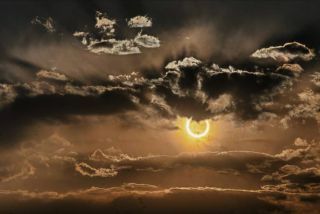 The observers attended a special event held at the University of Colorado's Folsom Field football stadium in Boulder, Colo.
Several national parks invited skywatchers to view the annular solar eclipse from scenic points, such as the Grand Canyon and Glen Canyon. "The site we had chosen was the Horseshoe Bend Overlook, where the Colorado River makes a spectacular 270-degree turn in the Glen Canyon," eclipse chaser Imelda Joson, of Boston, Mass., told SPACE.com in an email. Joson and her husband Edwin Aguirre are veteran sky photographers and SPACE.com contributors. Imelda Joson endured the desert heat to document the Moon’s passage across the sun with her portable Takahashi FC-60 telescope fitted with a Thousand Oaks metal-coated glass filter. "The sky was perfectly clear in Page throughout the day, but hot," Joson said. "Since the Horseshoe Bend Overlook happened to be less than a half-mile from the eclipse track’s central line, the more than 600 amateur astronomers and tourists gathered at the site were able to witness a perfectly concentric solar 'annulus,' or ring, during mid-eclipse at 6:35 p.m. local time, with the sun about 10 degrees high in the northwestern sky." Even places where the "ring of fire" climax of the eclipse wasn't visible saw record skywatcher turnouts of people seeking a chance to see an amazing partial solar eclipse. In Boulder, Colo., the University of Colorado opened its Folsom Field football stadium to thousands of eclipse-hungry observers in what organizers billed as the world's largest solar eclipse viewing party. The event was organized by the university's Fiske Planetarium and Sommers-Baush Observatory. "I can't think of words," Bryce Pantoja, 15, whose family traveled from the nearby city of Castle Rock to view the solar eclipse, told SPACE.com. The excited crowd booed when clouds threatened to cover the sun during the eclipse, then cheered ecstatically when they cleared in time for the time of maximum eclipse, according to Stephanie Pappas, a senior writer with SPACE.com's sister site Livescience, who attended the event. In San Francisco, several hundred skywatchers gathered at Crissy Field just east of the Golden Gate Bridge, in an event organized by the Exploratorium science museum and the San Francisco Amateur Astronomers (SFAA) club. The city didn't witness the "ring of fire" eclipse seen a bit farther north and east, but this regular partial eclipse was plenty spectacular. It was a clear and sparkling — though typically chilly and windy — San Francisco day, and the moon chased the sun down over the iconic bridge as sailboats plied the choppy waters of San Francisco Bay. "It's a lot of fun, and I like to help people kind of understand a greater reality than they enjoy every day," said Dave Frey of the SFAA, whose instruments let folks see the sun in both visible wavelengths and red-hued hydrogen-alpha light. "I also like the theater aspect of it," Frey told SPACE.com senior writer Mike Wall, who watched the eclipse from Crissy Field. "It's kind of like being a carnival barker." A "sun gun" shows an image of the partial solar eclipse of May 20, 2012 in San Francisco as the Golden Gate Bridge looms in the background. Six-year-old Cal Smolenski came to the event with his family, and with a homemade eclipse viewer — a cardboard box that projects an image of the eclipse onto its back inside wall. It was Cal's first eclipse, and he said it was pretty cool "that the moon covers up the sun." A cheer erupted at 6:28 p.m. local time when the eclipse peaked. The crowd began thinning after that. Some folks trekked across the street for an eclipse-themed members appreciation night at the Exploratorium, while others went out for dinner or headed home — someplace out of the wind, anyway. With the solar eclipse now in the history books, skywatchers and astronomers are now turning their attention to the next major celestial event: the rare Venus transit of the sun on June 5. On that day, Venus will cross the sun, as viewed from Earth, in a rare solar crossing that will not occur for another 105 years. No one alive today will ever witness the sight again, astronomers have said. The next solar eclipse, however, will occur on Nov. 13 and be visible from the South Pacific Ocean and parts of northern Australia. SPACE.com senior writer Mike Wall in San Francisco and Livescience senior writer Stephanie Pappas in Boulder contributed to this report. Follow SPACE.com Managing Editor Tariq Malik on Twitter @tariqjmalik. Follow SPACE.com for the latest in space science and exploration news on @Spacedotcom and on Facebook.